Last night St. Hildegard of Bingen visited Calvin College. She sang, accompanied by a plucked psaltery, or by a handheld harp, or by a fancy wooden box that she cranked to create an otherworldly drone. She told us that she was worried about people of our time, and she had come back to remind us to seek the Living Light and honor the unity of life. Apparently, the Calvin Women’s Chorale knew she was coming, as they had prepared several of Hildegard’s plainsong Latin compositions. They stood surrounding the gathered crowd, these beautiful young women in long black dresses, and their pure voices transformed the recital hall into a medieval abbey church. I felt myself settling, after a long week, into the poignant, flowing serenity of modal music. St. Hildegard seemed in a chipper mood, perhaps because she’s been dead now for 833 years, and thus has had plenty of time to rest up. Or perhaps she was feeling triumphant because she has recently been canonized and declared a Doctor of the Church—well deserved and overdue for this extraordinary visionary. During her life, she was a beloved abbess, a composer, an expert healer, and a writer and illustrator of her visions. She is admired now both for her loyalty to the church and her insistent challenges to reform it—not an easy balance to achieve, as we all know. As I listened last night, I thought back over the week and reflected gratefully on the ordinary saints among whom I live. These are the saints who feel as if they are still feebly struggling, as if the darkness is still pretty drear. And yet, I witnessed many small glimpses this week of the faithful, true, and bold among us. Last Saturday, a group of sixteenth-century scholars gathered at an academic conference to pray for one of our dear colleagues, who only the week before had been diagnosed with a brain tumor. She is one of the most generous, gracious people any of us know. We all owe her so much. St. Margaret of Waterlo. On Sunday, I was driving home from the conference, so I missed worshipping with the little band of souls who model Christ to me every week. I made it home, though, in time for a Grand Rapids Youth Symphony concert, conducted by a hard-working saint whose praises I have already sung in another post. St. John of the Youth Orchestra. On Monday, the faculty of Calvin College gathered to grieve over some recent financial news and summon our strength for the work ahead. One of our colleagues stood up and gave an astonishing testimony, I think aimed at our new president, about how she had taught all over the world, and had never seen anything like the dedication and faithfulness and sacrifice of this faculty. Wait, you mean… us? I imagined us all thinking. I looked around the room, and thought: she’s right. Knights of the Order of Knollcrest. On Tuesday, several members of my Shakespeare class performed a ten-minute adaptation of As You Like It in which a large Canadian guy played the role of Rosalind in a pink sparkly tutu, and a petite young woman played the role of Orlando—with a hockey stick, eh? Twice a week, the joy and creativity of this class increases the net amount of delight in the world. St. Brent the Hilarious, St. Carissa of McBain, and all the saints of room 227. On Wednesday, Jes wrote an admirable post about women reformers of the sixteenth century, particularly in Germany. I could add my own vote for the remarkable women of the English Reformation, whose writings I have studied, with much pleasure, for twenty years. St. Mary of Wiltshire, for example. On Thursday, three of my writing students stayed after class for a full half hour in the late afternoon to help another student with his essay draft. He’s writing about his own struggles to experience the easy intimacy with God promised in evangelical culture. We talked about God’s profound otherness, about feeling God’s absence, about how his doubts and struggles often get dismissed as merely an immature phase. “I want my questions to matter,” he said. St. Will the Philosopher. That same day, a few faculty and staff had gathered first thing in the morning to pray for a colleague who had collapsed suddenly the day before from a pulmonary embolism. Too young, leaving a family behind, he died Thursday afternoon, winning his victor’s crown on All Saints Day. St. Paul the Gentle. And then yesterday, Friday. I helped my parents, two very tired saints, plan for the last stage of cleaning out their almost-emptied home. In the mail when I got home was a card from a woman whose brother had recently died. He was a very shy, amazingly skilled textual scholar whom everyone admired and hardly anyone had actually met. I had written an article with him many years ago, and so had sent his sister a card when he died suddenly several weeks ago. Thanking me for my card, she wrote that she was “especially bereft” because she and her brother had planned to travel together in their retirement. Her final plea: “Keep his legacy alive.” St. Noel the Recluse. Becoming a saint doesn’t always feel so marvelous in the moment. 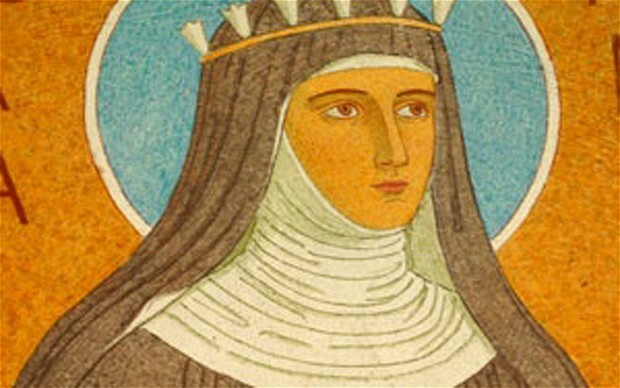 Hildegard, historians now believe, suffered from migraine headaches. She ought to be the patron saint of headache sufferers, although Teresa of Avila and a couple others have apparently beaten her to it. Her migraines corresponded with her visions, perhaps even enabled them. The brain that perceived overwhelming light, cosmic oneness, the unity of the Godhead, the viriditas burgeoning in the woods around her abbey—that brain suffered for its extraordinary perceptions. The strife can be fierce, the warfare long. Hildegard is gloriously shining now, and enjoying her concert tour in the twenty-first century. The rest of us still wonder and suffer, trying to be faithful. Even we Protestants need the saints, glorified and not yet glorified—to show us how it’s done, to give us encouragement with the example of their lives, to remind us that “All are one in Thee, for all are Thine.” Alleluia.